Christine Cunningham is a lifelong Alaskan, author, and outdoor columnist known for her contributions to outdoor magazines and her commitment to creating opportunities for women to connect and share their stories. 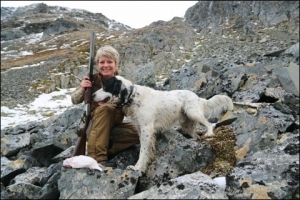 Her first book, “Women Hunting Alaska,” profiles some of Alaska’s most outstanding female hunters. When we think of bird hunting, we instantly go to a sacred place that exists in our hearts – a sacred covert we protect. We dream of finding that place again and want to know it will still be there long after we are gone. As a group, we engage in friendly debates about the dogs, guns and game we prefer. We share our stories, but it’s that moment we find alone in the field that we think about at the end of the day, in a comfortable chair. The birds we hunt are worth finding for the first time, worth fighting for and worth remembering.